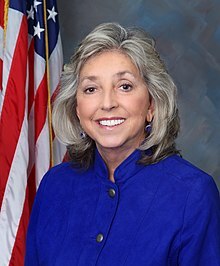 Dina Titus (born May 23, 1950) is an American politician. She was born in Thomasville, Georgia. She is a member of the United States Democratic Party. Titus was a United States Representative from Nevada's 3rd congressional district from 2009 to 2011. In 2011, Titus was defeated by Republican Joe Heck. Titus became a U.S. Representative from Nevada's 1st congressional district in 2013. Titus received a 100% rating from the Planned Parenthood 2014 Congressional Scorecard for opposing a nationwide abortion ban after 20 weeks. ↑ "Dina Titus-Nevada". Elect Dina Titus for U.S. Congress. Retrieved January 6, 2018. ↑ "Planned Parenthood". Planned Parenthood. Retrieved January 6, 2018. This page was last changed on 7 January 2018, at 05:35.